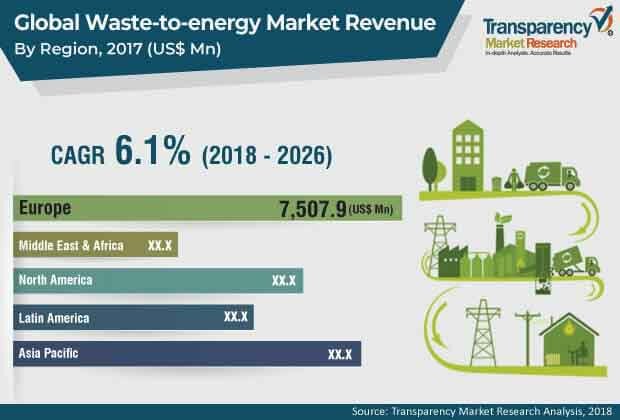 The global waste-to-energy market was valued at around US$ 19 Bn in 2017 and is anticipated to expand at a CAGR of more than 6% from 2018 to 2026, according to a new report titled ‘Waste-to-energy Market – Global Industry Analysis, Size, Share, Growth, Trends, and Forecast, 2018–2026,’ published by Transparency Market Research (TMR). Waste-to-energy (WtE) is a process that converts non-recyclable waste into usable forms of energy such as heat, fuels, and electricity. WtE can be achieved through several processes such as incineration, gasification, pyrolysis, anaerobic digestion, and landfill gas recovery. Waste management is becoming a major issue across the globe. Every year, billion tons of waste is generated from agriculture, municipal, and industrial sectors. Member countries of the Organization for Economic Co-operation and Development (OECD) accounted for approximately 50% of the global waste in 2016. Around 17 million tons of waste is produced every year in the U.S. and approximately 90 million tons of manures and slurries are generated every year in the U.K. According to the World Bank, the global waste generation is projected to nearly double, in terms of volume, by 2025 to reach 6 million tons per day. Several countries are opting for alternative sources of energy due to restricted landfilling, growing environment-related issues, and high volatility in fuel prices. Waste-to-energy (WtE) is a process of generating energy by treating waste. WtE not only resolves environment-related issues related to waste by reducing the volume but also decreases the greenhouse gas (GHG) emissions. Thus, high availability of waste is likely to boost the market during the forecast period. Among technologies, the thermochemical segment dominated the global market in 2017. In the thermochemical technology, high temperature is employed to generate energy. This technology includes combustion or incineration, gasification, and pyrolysis. Incineration is the most commonly used thermochemical technology for generation of energy from waste. Incineration is controlled combustion of waste. Combustion results in transfer of 65%–80% of heat content of the organic matter to hot air, steam, and hot water. The steam generated, in turn, can be used in steam turbines to generate power. According to 42 U.S.C. 6343 – ‘Waste Energy Recovery Incentive Grant Program’, a grant of US$ 10 shall be given for every MWh of electricity produced. The grant shall be given during the first three calendar years of production, beginning on or after December 19, 2007. The GHG policy can impart direct and indirect benefits of using biomethane, either in the form of emission pricing and limits or on the basis of minimum performance standards. The EU policy 2014/C 200/01 provides guidelines regarding environment protection and energy. It states that the state aid for producing energy from renewable sources utilizing waste, counting even the waste heat as an input fuel, can contribute to environment protection. Among applications, the electricity generation segment dominated the global waste-to-energy market, holding more than 50% share, in terms of value, in 2017. The segment was followed by the heat segment. Power consumption in Asia Pacific and other regions has increased considerably over the last few years. Strong growth of economy and rise in population have increased power consumption. The others segment is expected to expand at a substantial pace during the forecast period. Europe dominated the global waste-to-energy market in 2017. Germany is a major country of the waste-to-energy market in Europe. The country accounted for more than 29% share of the market in the region in 2017. The U.K. and France are other major contributors to the waste-to-energy market in Europe. By the end of 2016, more than 125 waste-to-energy plants were operating in France. In 2017, more than 14 million tons of municipal solid waste was treated in France facilities for energy recovery. The U.K. is investing in new biomethane projects. Around 48 new biomethane plants are likely to be built in the U.K. by 2020, with an investment of up to US$ 522 Mn (EUR 455 Mn). The global waste-to-energy market is highly fragmented. A large number of local and international players offer waste-to-energy services. Key players operating in the global market are Veolia, SUEZ, Covanta Holding Corporation, Keppel Corporation Limited, Constructions industrielles de la Méditerranée (CNIM), China Everbright International Limited, Babcock & Wilcox Enterprises, Inc., STEAG GmbH, Future Biogas Limited, and Gazasia Ltd.